Anyone visiting Rome between Christmas and Easter would be a fool not to eat some local artichokes. Whether you opt for them fried, braised, tossed with pasta or raw in a salad, artichokes are one of the highlights of this period of the year and a sure sign that spring is on its way. Although artichokes start to appear at Roman market stalls from October onward, these varieties are mainly from southern Italy and France. While delicious in their own way and indispensable for certain recipes, the true Roman globe artichokes begin to pop up in the new year. Production increases (and prices decrease) fiercely as they hit peak season in early spring before we wave goodbye to them for another year. This seasonality, as with so much of the fresh produce in Italy, makes the few months of artichoke season an absolute joy as locals and visitors alike devour these odd-looking, purple-green flowers in as many ways as possible while they can. The locally-grown Roman artichoke varieties (look for romaneschi, cimaroli, or mammole) offer rich, fleshy, interior leaves and usually do not have the spiky inner choke often found in other types. While other countries usually eat the leaves and discard the stalk, in Rome we usually trim the hard, outer leaves along with the base and exterior part of the stem before preparing and cooking the artichokes whole, making the result fully edible (many Romans believe the stem, or gambo, to be the best, most flavorsome, part). Once cleaned it is important to rub them with fresh lemon and keep them in water with lemon juice to prevent them oxidizing and turning black. After trimming the exterior, the internal cavity of the artichoke is stuffed with a mixture of finely chopped garlic and herbs (parsley and Roman wild mint). They are then packed stalk-up in a pan, covered with olive oil and water or white wine, and braised until they become soft and melt in the mouth. Historically, a dish of Jewish-Roman cuisine, these fried artichokes are now fully integrated into Roman life. After cleaning, the artichokes are gently fried whole before being left to cool. Then, just before serving they are re-fried at a higher temperature to encourage them to open out like sunflowers and crisp up the leaves until they turn golden. After a sprinkle of salt, they are eaten petal-by-petal with the hands, like potato chips. It is more about when than where. Although the importation of produce from abroad means that many restaurants in Rome will keep artichoke dishes on the menu 12 months of the year, in the summer they are likely to be substandard, especially if ordering the Roman recipes above. Once the season really kicks in they are found on most menus but generally the Jewish ghetto area of Rome is best-known for its fresh artichoke dishes and you will see mountains of them piled outside of the restaurants along Via Portico d’Ottavia. 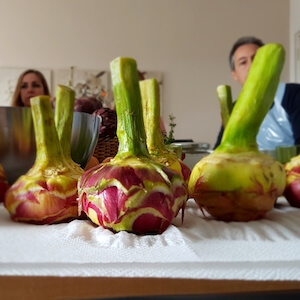 Remember that in Italy fresh seasonal produce is often not written on the menu as it is subject to change on a daily basis so make sure to ask if there are carciofi on offer that day. Markets in Rome are the perfect place to buy the best artichokes and more often than not will even clean them for you for a small extra charge, saving you a lot of time and potential injury! If you tell the stall holder what you are planning to make they will happily ensure you have the right ingredients and may even impart their own recipe. To taste market-fresh artichokes head to Testaccio market where the huge range of street food stalls will serve up the Roman and Jewish versions for you to taste on the go. Find out more about seasonal Roman produce on our Market Tour of Testaccio and Sunday Farmer’s Market Tour. And find a look at what else you should be eating in Rome on the Local Aromas foodie blog! Find out when, how and where to eat one of the most important ingredients in traditional Roman cuisine. Don't miss the chance to eat local artichokes when you visit Rome.